Fairy tales and folktales have served as fertile ground for many stories, novels, cartoons, movies, and games. They speak to common – possibly timeless – human emotional concerns. Despite being retold again and again until they are cliché and their images instantly familiar, something about fairytales always remains fresh and new, speaking expressively to even long-familiar readers or hearers. Fairytales unite the ordinary and the extraordinary in stories full of magic, wonder, and moral lessons. 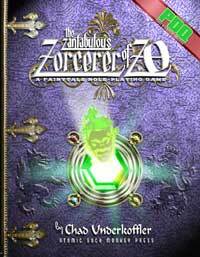 The Zorcerer of Zo (ZoZ) is a fairytale RPG using the PDQ System. If you've posted anywhere about your play of this game, please don't be shy — add a link!